CSS is the first choice of designers for creating a website more attractive and beautiful. CSS are now important elements for any website design. CSS is simple way to style you sites cssediterfont, colors, spacing etc. CSS editors are editors that focus solely on generating cascading style sheets. While developing a page , all the time is consumed in constructing and fixing the codes to get what exactly is desired. But sometimes, coding takes a lot of time especially if you’re not too familiar with it. In this article, we presents the top 10 best css editors. Hope you like it. syntax highlighter for many languages (20+) and customize syntax highlighter. Free CSS Toolbox helps you to optimize and validate your existing CSS code. It offers advanced formatting options that can make it easier to work with your code, as well as optional compression to reduce the load time of your style sheet. The program also includes an integrated CSS syntax checker as well as code validation via W3C website. Stylizer was developed to make it easy for any user of Word to reformat documents properly, through the intelligent application of Styles, and the automation of routine formatting tasks. Stylizer makes the application of Styles as simple and as fast as Word’s “Find and Replace”. Stylizer is useful at all Word shops that need to quickly and easily apply the firm’s standard templates and styles to documents. Rapid CSS can quickly and easily create and edit cascading style sheets of any complexity. You can write the style sheet code manually or let the program do it for you. In each case it is easy because of various helpful functions like auto complete and code inspector. Results are shown instantly using built-in preview. It is also an HTML editor and it makes CSS powered HTML editing a snap. It is designed to save your time and make the job easier. 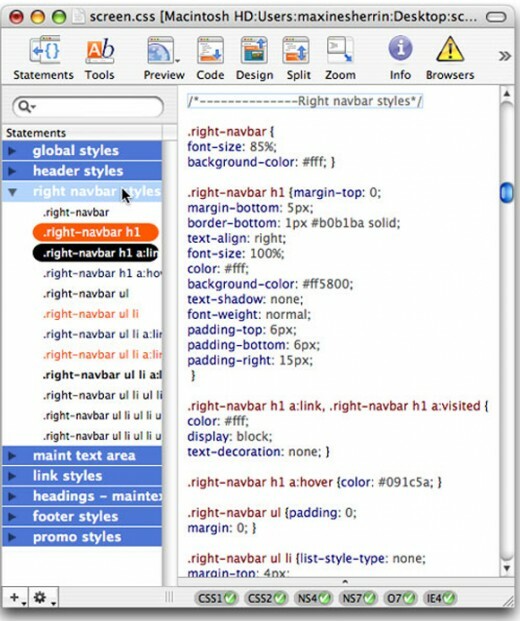 JustStyle CSS Editor is full-featured, yet easy-to-use, software for webmasters. It is a specialized style sheets development environment, featuring everything needed to develop and deploy cascade style sheets. 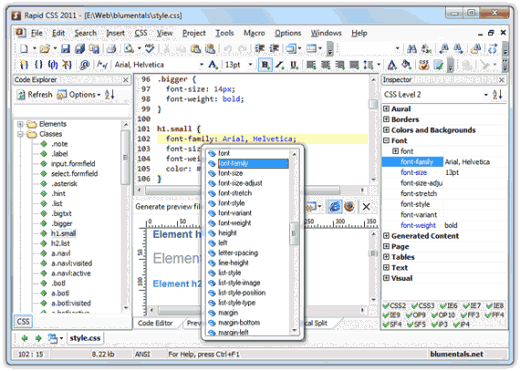 JustStyle CSS Editor provides an interactive user interface and presents CSS properties in special wizards and generic value lists. 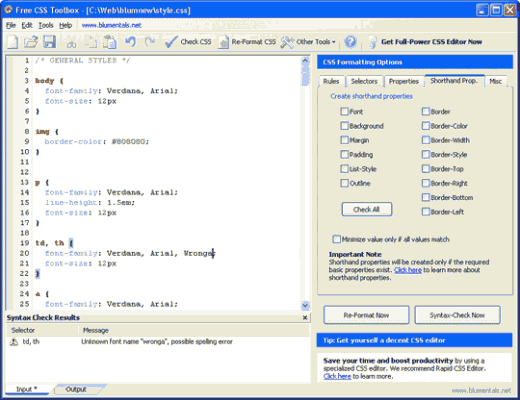 JustStyle CSS Editor provides an interactive user interface and presents CSS properties in special wizards and generic value lists. Easily deploy style sheets by using JustStyle’s Site Manager. Site Manager provides features like attaching and embedding CSS into HTML documents. 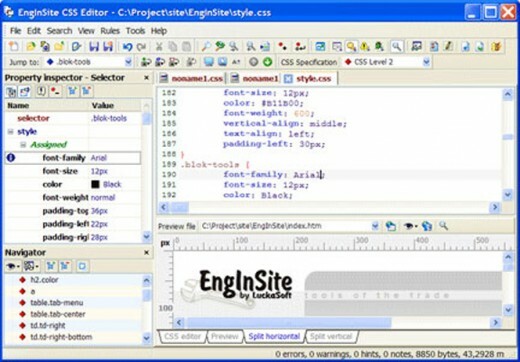 JustStyle CSS Editor is a cross-platform application. Written entirely in Java, it works on different platforms, such as Microsoft Windows, IBM OS/2, Linux, Apple Mac OS, Mac OS X and others. Cascading Style Sheets (CSS) is a way to specify the styles of fonts and other page elements on your sites. It makes it easier for you to update styles too, because when done right, you only need to make a single change to update the styles on multiple pages and elements. Another bonus is that your visitor’s browser needs to load less data per page, helping you reduce your data transfer usage while serving the same information. Simple CSS allows you to easily create Cascading Style Sheets from scratch, and/or modify existing ones, using a familiar point-and-click interface. With Simple CSS, you can manage multiple CSS projects and import your existing style sheets. Simple CSS supports CSS2. The only disadvantage I found on this cool app that I was not able to filter/search for Class/ID names. I still prefer using the traditional way of building CSS files, but this tool would be very helpful for CSS Starters. If you are a serious designer who cares about correct CSS specification, right CSS placement, or your CSS stylesheet must be fully-validated, then EngInSite CSS editor can be your favorite editor. In this editor, you can add class, id, and element selector with the help of its built-in inspector, also you can convert the color to either Hex or RGB value, which is a very rare feature for a CSS editor. You can observe your result in the preview panel with measurement tools to ensure that your every design element is on the right position. Preview is instant: see what you type when you type. CSS Specifications and target browsers descriptions are flexible, documented, and completely editable. CSS Property Editor with dynamic shorthand properties support. Various code tools, like Expanding/Extract URLS, Convert Colors, Convert Code and so on Unicode and UTF-8 Support. Since this WYSIWIG-CSS-editor calls itself a master it needs to have some nifty features which let the tools stand out from the crowd. In fact, Style Master enables both newbies and professionals to create valid and semantically correct stylesheets. The selectors can be grouped by alphabet, category or current settings. 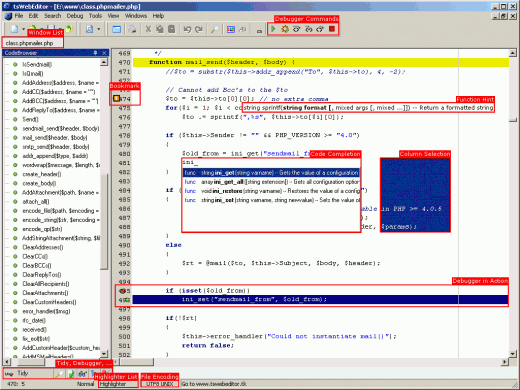 The editor has an integrated color picker, various templates, wizards and validation tools. 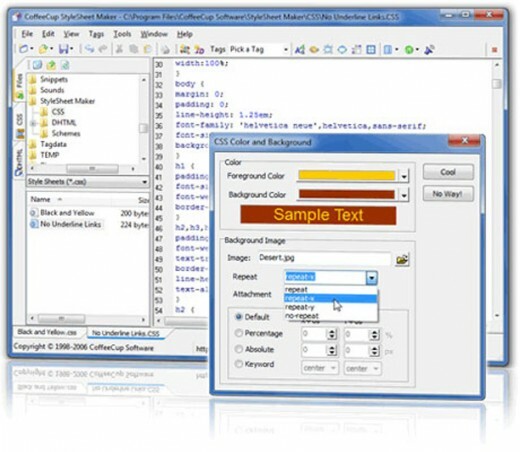 CoffeeCup StyleSheet Maker offers CSS-editing options which offer something between sophisticated editor’s functionalities and basic editing features. It resembles TopStyle yet clearly doesn’t achieve the same level of flexibility.Using TopStyle you’ll also be able to overlap text, create links that aren’t underlined, place image backgrounds in tables, and even create your own tags with the functions you assign them. 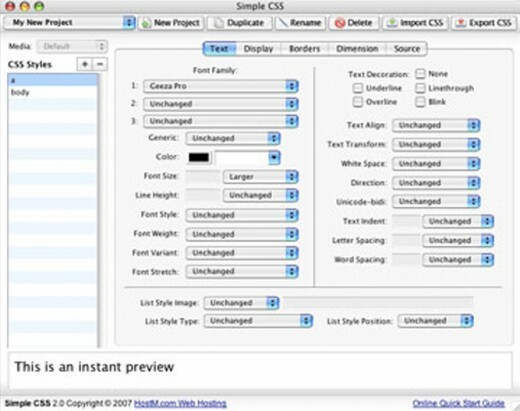 Easy CSS Font Designer, just select from the drop down menus. Edit, Save, and Open .css, .html or .txt documents. Class & ID Wizard for Creating your own HTML Tags.